Even after rethinking its new Drew and breaking things off with The Odd Couple, CBS is still devoting plenty of resources to reboots, remakes, and generally any reimagining of various TV shows. Maybe it‘s the strong showing from the new, still-muletted MacGyver? But the network just won’t let a once-popular idea go, especially not when it has the chance to bring a property back to its TV environs, as with Justin Lin’s SWAT reboot. CBS’s latest foray into familiar territory will revisit The Honeymooners, according to The Hollywood Reporter. 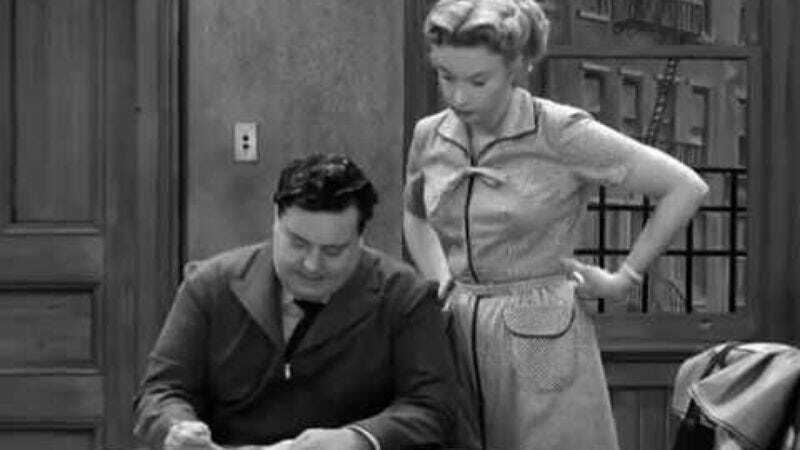 The Honeymooners was updated for filmgoers in 2005, but this reboot would return the property to its original CBS home. TV writer and producer Bob Kushell has been entrusted with rejiggering the 1955 sitcom born of a recurring sketch on Cavalcade Of Stars and The Jackie Gleason Show. Kushell has written for The Simpsons, 3rd Rock From The Sun, and Grounded For Life, but he recently stepped into a co-creator role with The Muppets reboot over at ABC. That project got the axe earlier this year, but maybe audiences will be more receptive of a reimagined Ralph Kramden rather than a newly single Kermit. Kushell will executive producer the series along with Carl Beverly, Sarah Timberman, Jeff Greenstein, as well as Eric and Kim Tannenbaum.